In an evening of debuts, Rice's Shawn Stankavage might have had the most significant impact on the game as the Rice starter. We charted his evening to get a feel for how new head coach Mike Bloomgren and new offensive coordinator Jerry Mack used him. Let's start at the end, Stankavage completed 7 of 15 passes for 43 yards. By comparison, Jackson Tyner completed 5 of 9 for 44 yards. Tyner played a few series in the second, but Stankavage was on the field for the bulk of Rice's drives. 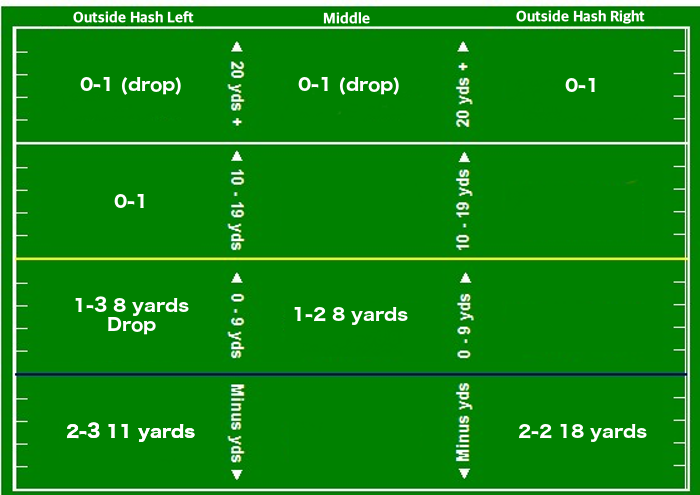 Outside of an option team, you won't see a passing distribution this light in modern college football. Oh, and from Stanford. What pops out is the lack of success beyond the short zones. Stankavage didn't connect on four attempts beyond ten yards. Two of those four attempts ended in drops, and a third was a throwaway. Stankavage checked down to the flats, and underneath routes and a lot of his throws were behind the line by design. We suspect the Owls didn't show much, even in a last-minute escape, but we never really saw Stankavage get into a drop, set, and throw on time to an intermediate or deep route. Prairie View blitzed Stankavage on seven occasions, he wasn't sacked but was hurried twice. Overall the Owl protection held up. When blitzed, Stankavage made the Panthers pay, completing five of seven passes for 25 yards. Stankavage reacted well to blitzing. The instinct is to turn away from the pressure, but the most opportunity comes from throwing into the blitz, where the extra rusher vacated. Prairie View brought more than four rushers on six attempts and brought a corner with the three down linemen on the seventh pressure attempt. Rice didn't cut Stankavage lose in favorable down and distance situations. Only twice did he throw in a second or third and short. The two attempts ended in a drop and a knockdown at the line. Eight of his eleven throws came out of 11 personnel (one back, one tight end). Three were out of two tight ends or 12 grouping, and another three were out of two back sets. One attempt came out of 10 personnel. A few general observations, first Stankavage throws pretty well on the move, especially on designed boots and when flushed from the pocket. He tends to check down and not look downfield in those instances. Again we never saw Stankavage hit his drop and throw downfield in rhythm, so we couldn't get a good feel for arm strength. One deep ball was on target, one was underthrown but playable, and the third was thrown away due to pressure. We'll see what Bloomgren and Mack do to add to Stankavage's plate in week two. Posted on August 28, 2018 by The Roundup and filed under Southwest Round-Up, Rice and tagged Shawn Stankavage Mike Bloomgren Rice Owls Jerry Mack Prairie View Jackson Tyner Film Room.